Brewed first in 2007 and again in 2013, 3 Fonteinen Hommage is a lambic loaded with raspberries and sour cherries. Located in Beersel Belgium, just south of Brussels, 3 Fonteinen was founded way back in 1887 as a Geuzestekerij, a blender of old and new lambic to produce geuze. Currently run by Armond and Guido De Belder, the brewery has had financial struggles, at one point selling all the brewery equipment and blending the remaining lambics into a special four part series; Armand ‘4 Oude Geuze. These limited release blends helped secure financing for 3 Fonteinen to continue. From the uncorking, Hommage strikes a presence with its bold ruby color and a potent bouquet of raspberries and an earthy funk. The white bubbles atop dissipate soon after pouring. The flavor is boldly fruit forward with sweet/tart cherry and raspberry initially, followed strongly with the earthy funk that washes over the fruit, sour notes, and the oak aging showing on the finish. The masterful blend of lambics brings such a complex funkiness that makes Hommage a different creature than, say Lindemans Framboise. Carbonation is good and the body light, making this a quaffable masterpiece. Sour beers with fruit can be one of the most satisfying styles to have survived Belgium beer styles near extinction. Currently, many brewers take on the challenge of making a complex sour base beer, sweetened with tart fruit. Sadly, the results are often weak, malty beers that have far too little character of flavor to be lambic, and too little fruit (it takes tons) to be fruit forward. 3 Fonteinen on the other hand, shows their mastery of blending, combining old and new lambics, with ineradicable local fruit, to make a world class beverage. Having tasted the best regarded of American wild/lambics with fruit, 3 Fonteinen Hommage stands out above them all as perhaps the most sophisticated, engaging, and ultimately satisfying sour fruit beer to cross our paths. Do yourself a favor and try something by 3 Fonteinen, the beers are world class. 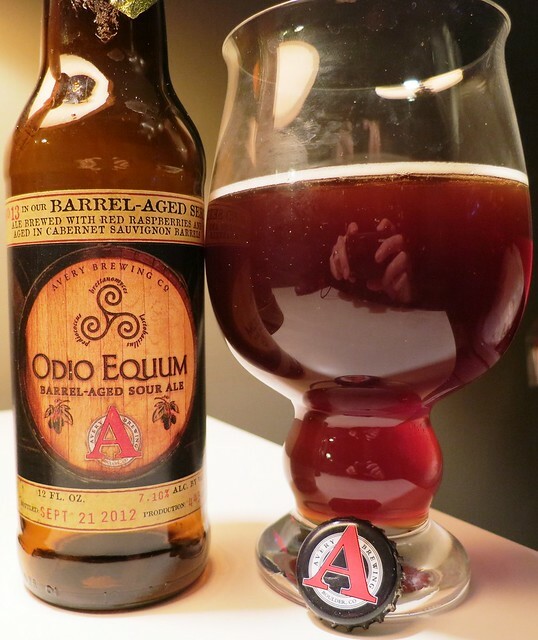 Our first taste of a limited release barrel-aging sour program from Boulder Colorado’s Avery Brewing. Avery, known to me for their amazing double IPA the Maharajah and their bourbon barrel-aged Uncle Jacob’s Stout, apparently has a huge lineup. Their limited barrel-aged series sours do not make our market so I had no idea they even attempted sour beers. Having had some really unpleasant experiences at a brewer who has been experimenting with sours with sub-optimal results. But Avery rarely disappoints, and at batch 13, like MTV releasing Buckwild, here comes another proven winner, releasing yet another take on craft beer.